beaches, no-where screams honeymoon quite like Africa. 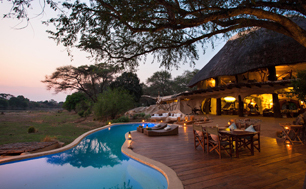 Africa seamlessly combines all the elements one might look for when considering a honeymoon. Luxurious accommodation in spectacular settings; exclusive and intimate camps set in vast tracts of wilderness; boutique hideaways on deserted islands. This is supported by discreet, yet pampering, service and hospitality, deliciously spoiling food and a perfect balance of adventure mixed in with relaxation and indulgence. It is impossible not to get swept up in the romance of it all. Africa loves honeymooners! - Lots of special discounts for brides and value added packages. Private candlelit dinners, sunset cruises, sleeping under the stars - all with just the two of you in mind. With virtually no time difference, you can start to enjoy your honeymoon from the moment you arrive. Safaris include everything, even drinks, so you can fully relax, not having to dip into your pocket again. Depending on when you are planning your honeymoon, we can advise where best to go. Below is a rough guideline.